Pencil Kings » Blog » Drawing Foundations » Job Vacancies for Artists: We Want You on Our Team! Job Vacancies for Artists: We Want You on Our Team! Pencil Kings Is Growing Quickly And We Need Artists Now! + 2D Artist/Animator, storyboard artist, and/or an Instructor. Can produce studio quality art and can teach their workflow to others via per-recorded video. Work from your own studio, at your own schedule. Perfect for professional working artists who want to work after hours. Our project allows us to sustain a start up culture that empowers you to drive change and create and decide the direction of your contributions. Your contributions will impact thousands of viewers daily. Does this sound like you? If so, we really, really want to meet you! At Pencil Kings, we are a tight knit, exclusive team who want to share our knowledge and empower others who have a passion to learn art. Just as we have benefitted from mentors in our past, it is time to share with others now. There is al lot of freedom and flexibility. You will work at your own studio, unsupervised and your own pace so this is for a disciplined individual. We value your input and want you to help shape our project. This role is perfect for those that want to build up their leadership and teaching skills. There will be no live instruction at this stage, only pre-recorded but you do need to be able to properly teach and demonstrate your workflow and the thought process that goes into the decisions you make. + Positive, outgoing attitude is mandatory. + Artistic fundamentals a must. + Ability to communicate fluently. + Basic computer skills- recording from your camera, exporting video. 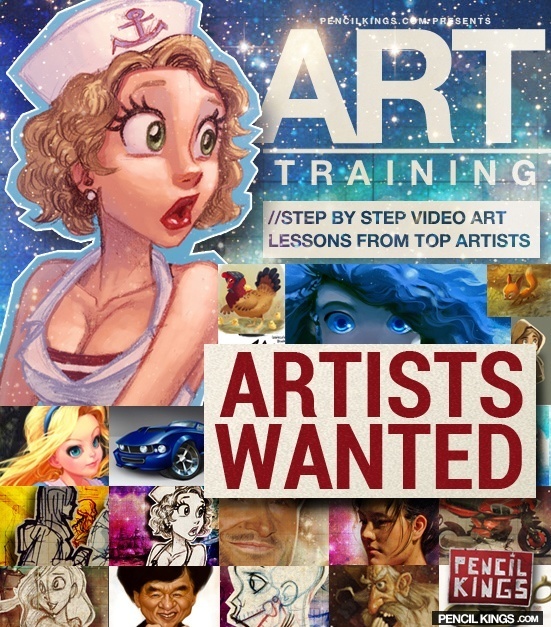 + Passion for art, specifically your discipline – sketching, digital, acrylics, etc. + Ability to deliver on set deadlines. We are very flexible with our dates but you must deliver once we agree to a set time. + Wage to commensurate with experience. Freelance to start. I’m interested for the the Job Offer. Please take a look at the link below for to see my samples. My name is Marco Arantes and I’ve got a lot of experience in 3D/2D animation, concept art, storyboards and character design. For films, games and the TV industry!Please find attached my CV in application for….. If you have any questions please do not hesitate to call me.Kind Regards,Marco Arantes Dear Sir / MadamMy name is Marco Arantes and I’ve got a lot of experience in 3D/2D animation, concept art, storyboards and character design. For films, games and the TV industry!Please find attached my CV in application for…..I have a strong background in art, and I am currently developing further my 3D animation skills at the university of Arts of London. ABC Diploma,3D animation and Modeling course 2009. In addition to this I have excellent english and basic spanish language skillsI am reliable and punctual person I can ensure this will be delivered at all times.